Ringing is the most popular and cheapest way for identifying birds individually. The regular metal rings have been used for decades and will probably be used later as well. 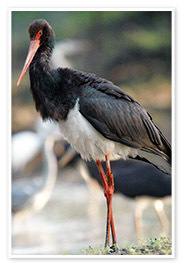 Reading the regular rings on a live bird is rather difficult, especially when the particular species is afraid of human beings – for example, eagles or black storks. As a rule, we find out the origin of the bird and its age only after it has been found dead. Sometimes we also manage to catch eagles and release them again but this has been more like an exception. Depending on the species less than one percent of the ringed birds are found later; in case of game birds this proportion is bigger and in case of passerines small. In case of spotted eagles it is probably important that they spend a large part of the year in Africa where they do not do the same things with the rings found as we do in Europe. They will rather stay in the necklaces of tribe leaders… In order to enhance the effectiveness of the rings, we have started using coloured rings. 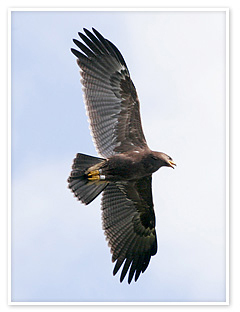 Golden eagles have been ringed in Estonia with coloured rings since 1998. A green ring around the right foot of each golden eagle refers to its origin from Estonia and the ring around its left foot refers to its birth year, for example, golden eagles hatched in 2004 received a blue ring on their left foot (just like sea eagles). Up to 130 golden eagles have been ringed altogether and there have been re-encounters on 16 times (12 times outside Estonia). Coloured rings were put on 81 birds and there have been 5 encounters later. Reading the rings of golden eagles is much more complicated than in case of sea eagles since their feet are feathered and the golden eagles themselves are much more fearful. They also like to visit the feeding sites of eagles and it is there where most rings are counted. Ospreys have not been marked with coloured rings in Estonia. Regular aluminium rings have been placed on the feet of 418 eaglets and 3 older birds. So far 7 of them have been found. However, it is possible for us to meet Finnish ospreys with coloured rings. There are ringed ospreys nesting in several places in Estonia but we have not got around to counting them. This would probably require a special project where the birds are observed from a shelter or caught. 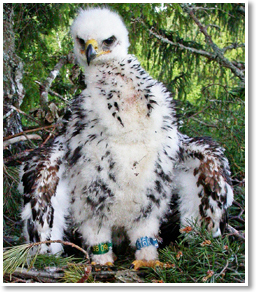 In Estonia the ringing of spotted eagles with coloured rings was started in 2006 when a white plastic ring with a black code was placed around the feet of 60 spotted eaglets. The same kind of a ring is placed both on lesser and greater spotted eagles because sometimes it is difficult to determine which of the species one is dealing with. Usually an aluminium ring is put around the other foot. Before coloured rings have been put around the feet of spotted eagles in Slovakia (yellow ring), less in Poland (different combinations on greater spotted eagle) and some rare cases in Germany (yellow). The Eagle Club is trying to organise coloured ringing all around Europe so that different areas use different rings and that there are no overlaps. Also, it is important that all the programmes of coloured ringing be described on the corresponding Euring website.